Al's Loves: What have I been up to? I'm a bad blogger. I figured since I havent written a post in months I would update you in a collage as to what I have been up to. 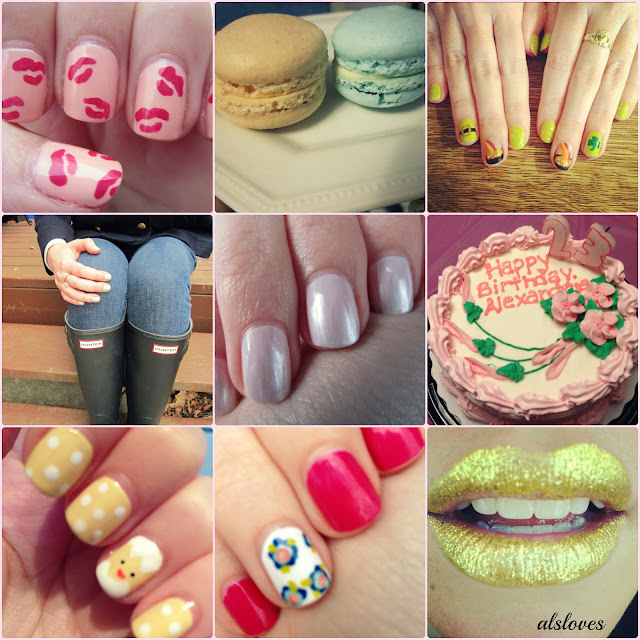 If you follow me on Instagram (AlsLoves) then you may have seen some of these. On Valentines Day I had kiss nails, with Essie A Crewed Interest and Fushia by Joe Fresh ♥ Then I tried macarons for the first time and hated them ♥ My St. Patricks day nails ♥ I got Hunter Boots! so excited ♥ Simple nail art with Revlon Post Modern Nail Art Expressionist ♥ I turned 23 on Good Friday! ♥ Easter Day chick nails ♥ Floral nails ♥ I finished my first year of beauty school! These are my lips that my friend did for her final! This is what I've been up to and I have plenty of nail art that I've been trying, to show you very soon!